Last modified on Sunday, November 16 2008. A 527 year-old Renaissance man presents to your office, complaining of numbness. You expertly diagnose him as having a mononeuropathy affecting the dorsal antibrachial cutaneous nerve. Which image most accurately illustates the pattern of sensory innervation provided by the dorsal antibrachial cutaneous nerve? This question was created on December 22, 2006 by jdmiles. This question was last modified on November 16, 2008. 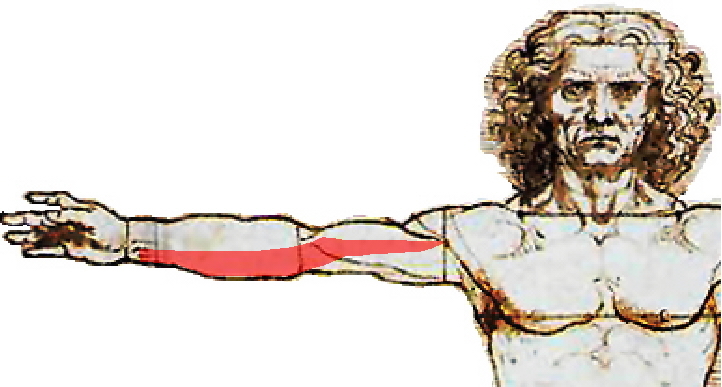 The following image illustrates the distribution of sensory innervation of some of the named nerves in the upper extremity.